From dust to dust. Or in this case from the clay dredged from the bottom of the holy Ganges, and back to its murky depths. The journey of Goddess Durga, believed to be her annual sojourn in her maternal home, is a metaphor for impermanence and temporality. Of all life. But also, in the sacred ritual that replays year after year, of death. 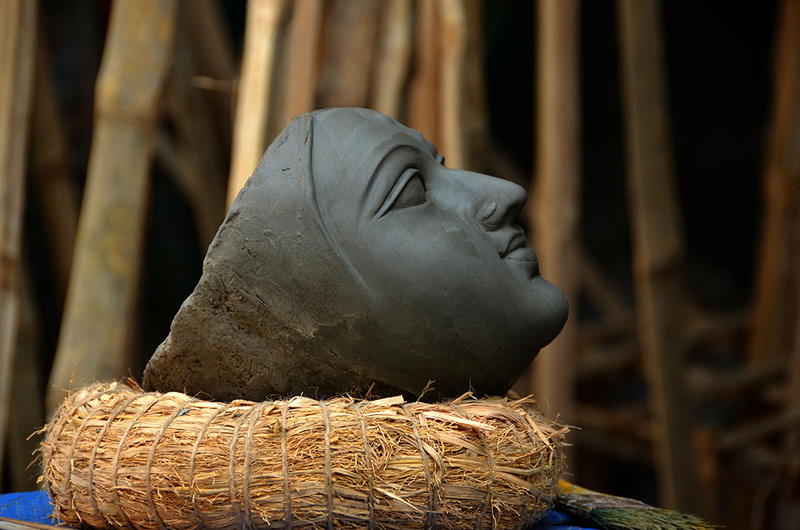 It begins here in Kumartuli (Kumhar = potter & Tuli = village) where hereditary artisans manipulate and mould a combination of straw, clay, rice husk and fine muslin, into her divine form. Culminating in the ritualistic filling in of the pupils, that assigns divinity and symbolically brings her to life. As the slayer of the buffalo horned demon ‘Mahishasurammardhini‘ or any of her one thousand forms. Her ‘life’ on earth is celebrated but short-lived. On the 10th day of Durga Puja, every single clay depiction of her image in every household, created with such love and devotion, has to be relegated to the holy river. With pomp & great ceremony. And with joyous anticipation of the next cycle. PS: Many thanks to Manjit Singh Hoonjan for making our walk through the divine tableaux of this potter’s village, so memorable. Thank you for sharing such interesting information. Your photos are wonderful, especially the first one. What a beautiful cyclical phenomena. What a trusting, believing, culture that will recycle such a beautiful cultural icon time and time again with such joy. India IS remarkable but I wonder for how long? I do too Tony. Nothing, however beautiful and sacred, escapes commercialism. Thanks for the introduction to the goddess. Fascinating, Madhu! The photos are wonderful–a peek into an ancient tradition. In Europe, as the last harvest is completed, the last sheaf of corn is fashioned into the Corn Maiden or Corn Mother (local traditions vary), paraded around the fields in gratitude for the harvest. Sometimes she is protected indoors through the winter and in the spring she is plowed back into the fields in hope of a good harvest. I find these customs so interesting. Thanks for another great post! Thanks Naomi. I suspect these rituals all probably have a common origin. Durga is said to bear an uncanny resemblance to the older Mesopotamian Goddess Ishtar – from her multitude arms bearing weapons to the lion mount!! Fascinating indeed. The heads are very good and obviously created by very talented people. The smoothness of the clay is outstanding. Having done pottery at school I know how hard it is to get clay into a very smooth finish like that which is on the faces. Religion can bring out the best in people but it can also bring out the worst in people. I once spoke to an Indian gentleman (in Glasgow, Scotland) who converted to Christianity from Hinduism. I asked him why he did this as many people keep the religion they were brought up with, as it is very precious to them. He told it was because Christianity has a Saviour in Jesus and only one God, while Hinduism has 330 gods. He also said he had the promise of eternal life with Christianity, which he did not have in the Hindu religion. His family were very upset at him converting to Christianity. Religion is a very powerful thing and can bring out such talent in believers. I have no doubt. But I am not in favour of the passions religion incites. The results are never very pretty here. The divide stretches down generations. Really fascinating to see how these lovely images are constructed, Madhu. It’s obviously a very special celebration. It is Sylvia, and I hope I can return during the celebration another year. Amazing, Madhu – thank you for sharing the information and the photos. That must have been a fascinating visit. Durga’s story is similar to the Demeter/Perspephone myth isn’t it? In the time she spends in her maternal home perhaps Gilly. But Durga is actually the fierce entity sprung from the fission caused by the merging of the powers of the Hindu Trinity. Along the way, her identity got merged with that of Shiva’s wife Parvati into a more benign Devi. My hometown – Mangalore – is an anglicised version of one of her many names – Mangala + Pura (town)! We celebrate Dussehra in a big way too, but nothing comes close to Durga Puja in Calcutta. I always feel a bit sad when thinking of how much westeners are losing of old traditions and habits – not to speak of rituals and things to do with faith. Traditions and the old ways gives life a stability and feeling of safety that we need, but are losing. Beautiful images and beautiful story. Very true. But that is the price of progress. I see it among urban youth here as well. Thanks Ann Christine. These are beautiful. Thank you for sharing. Just a question: Is Durga the wife of Shiva? stunning post Madhu! Your beautiful photos bring the scenes to life, centuries of skill and faith creating these images that are, like our bodies, destined for a short stay here on Earth. I do hope this tradition continues and the skills are passed on to the next generation. Thanks for explaining Durga’s origin and symbolism, I can imagine a fierce entity springing from Brahma Shiva and Vishnu, and the link back to Ishtar is no doubt valid too. We need our stories and archetypes to make sense of our lives. Any powerful feminine deity surviving today should be doubly celebrated! Thank you Christine. You are right. That an ancient female deity survived the Aryan patriarchal religions is amazing in itself. In fact in some regions – West Bengal for one and my hometown – she is given more importance than Brahma, Shiva or Vishnu! Strange also that in a predominantly male dominated country, ours (in Mangalore and the district it is part of) is a matriarchal society! Perfect title. The artistry that goes into these creations, to honor Durga is just one aspect, but the fact that these are returned to the holy waters is what is beautiful. Time honored traditions. Beautiful pictures depicting the process. It is sin’t it? I was surprised too by how clean the village was. An absolute must do in Calcutta. Thanks Lynne. Lucky you 🙂 Yes, I saw some of the fibreglass idols, and they were ghastly. The real threat to this tradition though is from the unwilingness of the educated children of these artisans to follow in their fathers’ footsteps. They, understably, have higher aspirations. So fibreglass Durgas might necessarily be the only option someday! A wonderful ritual to remind people of life’s impermanence. Fascinating. How does the ‘recycling’ affect the river. Thank you for sharing your beautiful photos and the back story on this tradition. You are most welcome Judy. The recycling was harmless until chemical paints started being used. I think there is a ban on those dyes, but not sure how effectively it is enforced. I am told quite a few deities are dredged out by the authorities after the festivities are over. Watched them making the ganpati images in Mumbai too. They are so clever. Those who deal in woodwork are quick and skilful too. Have never witnessed a Ganpati Visarjan in Mumbai. Must be huge! Since you have been there, I have a question for you. Is it true that these divine forms are only completed with the clay mixed with dust sample from a prostitute’s doorsteps? This is a fascinating story. Of course there’s creation and destruction here, but then there is also something more permanent that comes about from it – the potter’s village, their trades, their livelihoods, what those things then bring to their children, etc. And at the same time nothing on earth is truly permanent even when we see it as such. It is my belief that most religious rituals, like the construction of cathedrals in medieval times, were conceived to provide employment. So yes the economics is a large part of Durga Puja in Calcutta. But it is increasingly becoming less viable for these artisans and coupled with the altered aspirations of their children, I don’t see how this can survive very long. Pity. I always come away having learned something from this blog Madhu. Thank you for taking the time to educate me. the first pic…it simply stole my heart.very true,the whole cycle symbolizes the life itself. One who comes is destined to leave. Thank YOU for reading Ken. I may never get to some of the many beautiful places in the world you have traveled. Thank you for making these places come alive for us, in your wonderful words and your stunning photos. Yours is a country so rich in symbolism. It is my pleasure to do so LuAnn. Thank you for always being so appreciative. Lovely piece here Madhu, a joy always to read them, now that I have been through some. It was an absolute pleasure to show you around the city and make you connect to it the way I do. It is always wonderful to come visit you, beautiful pictures combined with graceful words and wonderful learning experiences. Fascinating reading! Always enjoy reading you post. The pottery work is incredible! Isn’t it? It was wonderful witnessing the entire process. Wish we could have seen a finished piece though. Thanks Amy. What a fascinating tradition, and so many wonderful shots and detail to go with this cycle of amazing events. It’s so nice to see the process of making it. Those arms look intimidating. Good thing I’m not a demon. Ahihihi 😀 I wouldn’t want to congratulate her whenever she slays a demon though. Too much hand shaking or high fives. Ahihihi. Ooops sorry. I’m often touched by the customs of foreign lands, and this one is no exception. Your photographs and narrative are beautiful. The Durga festival in Kolkota is always fascinating to witness live. Fascinating mainly because it celebrates the victory of Good over Evil. Beautiful pictures. What a fascinating religious tradition! As in everything else, the old craftsmen are dying and the young people are not interested in carrying on. I miss the fine craftsmanship of handmade tools, furniture, writing implements, etc. I always thought the demise of culture began with plastic. The images and story here are wonderful, as always, Madhu! Durga is a well-revered goddess in Indonesia. Prambanan temples in Java were built in the 9th century for her. Today the temple compound still stands elegantly despite the perennial threats from volcanic ash and earthquakes. Creating art is always fascinating to me. I enjoyed seeing process on the video. This whole post is absolutely fascinating, Madhu. You’ve managed to pack so much information and culture and faith into a small space — the images are so clear and immediate, but the reality of them is complex and needs thinking about. At first I thought of the Japanese principle of AWARE, that something is beautiful BECAUSE it is ephemeral — that it will vanish is what makes it precious. But I don’t think that is what is at work here. It may be more a Zen maxim: don’t cling. Let it come, let it arise, then let it go. And how could you cling to a goddess/demon anyhow? The photographs are glorious, especially the opening of the head of Durga coming into being. Yes, the temporal it’s of life is symbolized but the love, care, devotion of the artisans and devotees never changes year after year, repeating their faith again and again….great post. This is interesting Madhu. I find it fascinating to learn people’s religious beliefs and what they do to show them.